Over the last several months, I've seen a site take a series of hits in traffic that I feel is the result of increased usage of user data to reorder search results. What I've seen is that the homepage and high quality content continues to increase in rankings on highly competitive terms (#2 for industry head term after bringing them up from 80+ a few months ago). However, traffic to subpages with bad user experiences dropped significantly. Upon inspecting their rankings, there does not appear to be a "penalty" but these subpages dropped from #1 to #2 - #4 across a wide range of keywords. The summation of this slight reordering across a large number of keywords is resulting in a large overall drop in organic traffic. Below are my thoughts on how search engines may be reordering results based on user data. Disclaimer: This stuff is nearly impossible to prove, but my thoughts are from reading patents, listening to Duane Forrester talk at SMX, and from experiences of things I've seen. #1 Bounce Rate from result returning back to the search engine. If a user clicks a result after performing a search, then comes back to Google.com search in a relatively quick amount of time, this could be a signal that the result was low quality or did not match the searcher's intent. Yeah, there is a lot of noise and caveats to this signal, but look at these results from a Google paper about bounce rate and ad landing page quality. They compare mean bounce rates to quality scores from evaluators. 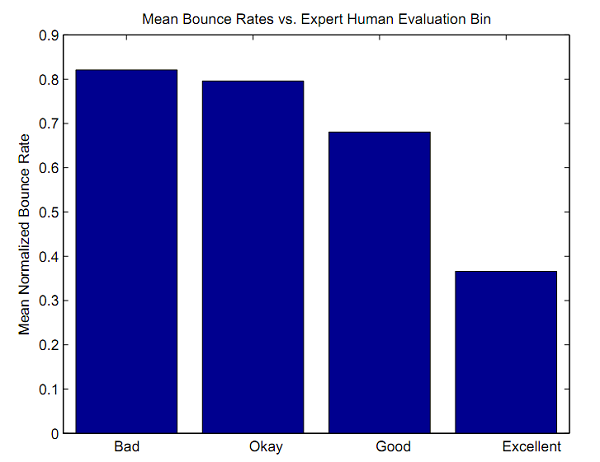 Results show that expert human evaluation of ad quality agreed well with implied user assessment given by bounce rate. That graph to me is a pretty big deal. The bounce rates for those in the excellent category were less than half that of those in the bad category. Ads that followed AdWords quality guidelines had bounce rates that were 25.4% lower than those that didn’t. It might be worth checking out their landing page and site quality guidelines. #2 The CTR on the result listing. CTR = total clicks on listing / total listing impression. You can bet Google is collecting this data. They know your domain’s average CTR, average CTR per URL, and CTR per keyword SERPs. They could also rotate top listings and collect data over time to determine if particular result receives a disportionate CTR relative to other top results. I find this graph from the same Google paper to be particularly interesting. Ads with low bounce rates had high CTR. These two metrics had a correlation of -0.85. That’s a strong inverse relationship. 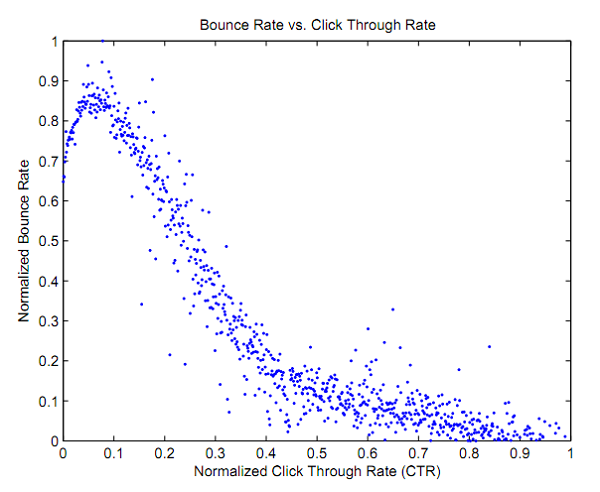 If bounce rate, as shown before, is a good proxy for user satisfaction, so is CTR. #3 The amount of time the user was away from the search engine before coming back. Duane Forrester from Bing made a comment at SMX during a panel that not only is the return to the results noted, but so is the time the user was away. If the user is gone for 5 seconds, that's very different than a user who was gone for 5 minutes. If a user clicks a result, returns in 5 seconds, clicks another result, and then never comes back, that's a potential signal. If a user comes back to a search engine after clicking a result, their actions upon returning can send corroborating signals to reinforce historical signals. This may include actions such as clicking another result for the same keyword, refining the search query, or even blocking a result. By crossing these signals with other signals, I feel Google can increase their confidence in evaluating result quality. This type of user satisfaction data could be used to reorder results to create an improved SERPs. Site #2 seems to provide an improved user experience for this SERPs, so although Site #1 has a stronger relevancy score based on links and content, let’s move Site #2 to the top result. This will result in a larger portion of satisfied users. Site #3 is the least relevant of the three, but its large brand creates affinity to this result and higher user satisfaction. Moving Site #3 to the second result will result in more satisfied users. A significant portion of searchers (~30% to 60%) are now likely to click on a result that creates higher user satisfaction. As a result of this reordering, this result page’s quality has been improved. This isn’t a “penalty” but moving a site down from a top result to a second, third, or fourth position is a strong drop in traffic for that particular term. If this is repeated across a large number of keywords, this impact on traffic may be significant. I think this is one way Panda could have had enormous impacts on content farm visibility without applying a “penalty”. Although link building can keep pushing up rankings, and is still a strong signal, search engines can gather this type of information on top results and readjust accordingly. Using the example above, Google would need to collect a fair amount of data overtime to make a significant claim about quality and user satisfaction. However, machine learning can be used to build a predictive model. This paper has demonstrated through quantitative and qualitative analysis that bounce rate provides a useful assessment of user satisfaction for sponsored search advertising that complements other quality metrics such as clickthrough and conversion rates. We described methods of estimating bounce rate through observing user behavior, and have provided extensive analysis of real world bounce rate data to develop the reader’s understanding of this important metric. We have also shown that even in absence of substantial clickthrough data, bounce rate may be estimated through machine learning when applied to features extracted from sponsored search advertisements and their landing page. The SEO game isn’t really changing, just Google is getting better at applying machine learning to user data, spam analysis, and topic modeling. The goal is still, as it has been for a while now, to not chase the algo, but to work to at least deserve to be listed as a top result. If you want to chat more about SEO, follow me on Twitter. I often write about link building, but I also love technical and research related SEO.